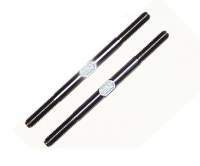 VPP1896T Titanium Steering tie rod set for MCD EVO II and EVO III models. To make sure we were able to bring the best quality product to the market we commissioned Lunsford Racing, the worlds leading supplier of Titanium products in the RC industry to help us get us off on the right track. Our process does not cut away material to make threads thus weakening them, instead our process displaces material which in turn retains the integrity of the material. - Weighing in at only 20 grams PER PAIR these are the ultimate upgrade for your MCD. - No more bending, breaking and having to replace your steel Tie Rods when used as a stock replacement, we do not guarantee fit or funtion with aftermarket products.